April 25, 2011 Angela G.
Say what you will about Texas, but they get things absolutely right when it comes to fast food – chiefly, above all else, the glory of Taco Cabana. The name is so misleading in its plebian nature, while the franchise dishes out tasty fillings in tender, pliant tortillas. May all the Taco Bells be stricken from the earth in place of this bastion of tex mex wonders. I first had Taco Cabana on a trip to Austin City Limits – the hubby and I woke up early at the hotel and decided to forage for breakfast. We wandered out of the hotel and found a shopping center with a closed Whole Foods and a very open Taco Cabana. With the best of intentions, we ordered a dozen mixed breakfast tacos in the hopes of bringing back the bounty to our friends back at the hotel. But no – we lapsed into total food amensia and ate every single taco without even realizing what we were doing. Dennis and I stared at each other in wonderment after attacking the mass of eggs, beans, potatoes, chorizo and cheese. It was just so good, we devoured the goodness with no hesitation. In that I don’t find myself in Texas too often (read: ever), I had to find a way to get my breakfast taco fix at home. I’d be lying if I told you that I actually eat this for breakfast though. This is the kind of home cooking that is thrown together at midnight and eaten directly from the kitchen island standing up. Utensils be damned, eating this dish transports us back to that day where we found some serious goodness in a Texas parking lot in a moment of unexpected perfection. Add potatoes, garlic and salt to a small saucepan and cover with water. Heat on high and boil until potatoes are tender when pierced with a fork. Drain and set aside. In a large skillet, cook the chorizo, breaking up the large pieces with a spatula. When the meat is just about cooked through, add the potatoes and allow them to crisp up with the chorizo. Set aside. In another skillet, heat 1 tbs. of olive oil on medium. Scramble your eggs in small bowl and slip into the pan with the oil. Turn the heat to medium low and gently push the eggs around the pan, allowing curds to slowly form. 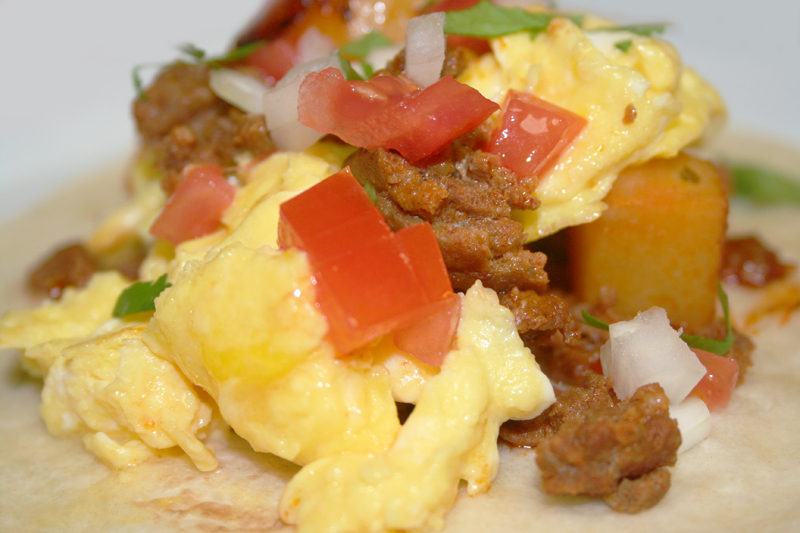 Assemble your taco by scooping some of the chorizo and potatoes onto a warmed tortilla. Top with eggs and a bit of the condiments of your choosing – Dennis likes shredded cheddar, but I love a bit of cilantro, tomato and onion. Dab with a bit of salsa and eat with reckless abandon. June 8, 2010 Angela G.
When I was a kid, on Saturday mornings or Sundays after church, my parents would occasionally take us to Bob’s Big Boy for their breakfast buffet. A veritable smorgasbord of all things bad for you, I used to tuck into the absolute same dish every single time – a big plate of fluffy scrambled eggs, home fries (the deep fried square kind), a mixture of cooked ham, peppers and onions, and cheese sauce over all. It was baaaaaaaaaaaaaaad. Like taste bud good and cholestoral bad news. But whatever – I was a kid and as much as I didn’t care about 401Ks and Roth IRAs, I wasn’t really invested in wholesome ingredients at the breakfast buffet. It was Big Boys for goodness sakes. To a small pot, add the onion, bell pepper, canadian bacon, water, salt, pepper and olive oil. Bring contents to a boil, and then immediately turn off the heat. Let sit while you prep your eggs. In a shallow dish, scramble eggs and milk together, making sure not to overbeat. Heat a large non-stick skillet over medium-high heat. When warm, turn heat to low and add butter to the pan. Swirl butter around the pan to slick the bottom and then add the eggs. As the eggs slowly cook, use your spatula to push the curds to opposite sides of the pan and allow the uncooked egg to run across the surface of the hot pan. Continue gently pushing the egg around until it is all cooked and just set – I like mine still a bit glossy and wet, but cook to your liking. 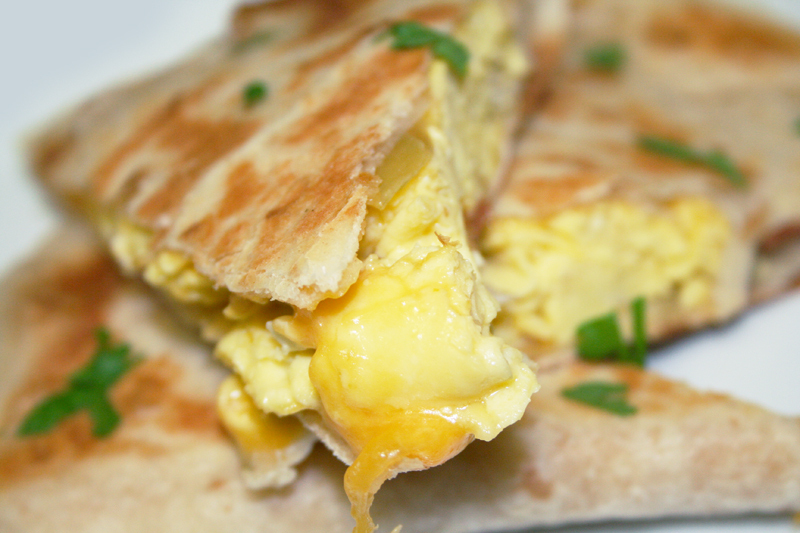 Sprinkle shredded cheese on top and allow to melt from the heat of the warm eggs. 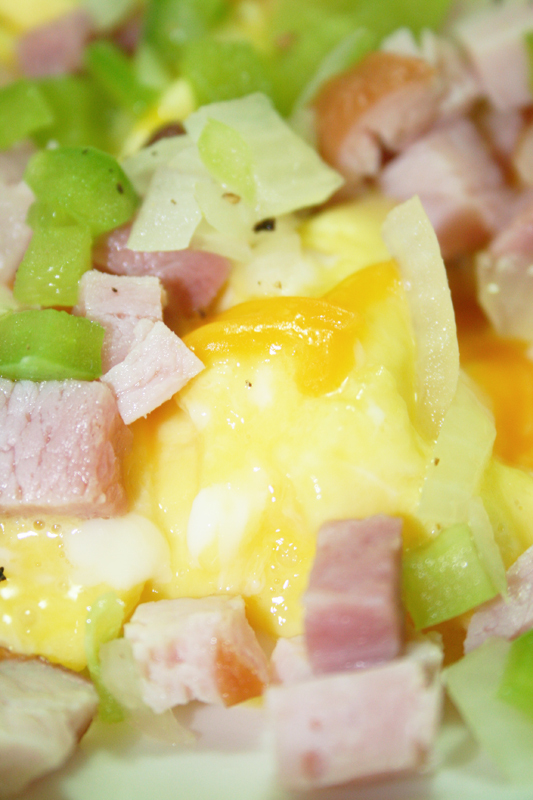 With a slotted spoon, scoop up some of the ham, pepper and onion mix and top a portion of the eggs. Dig in to straight up breakfast comfort. I’m a bacon and eggs girl all the way, and I believe in the savory goodness of a breakfast served 24 hours a day. And given my proclivities to resurrecting leftovers with simple ingredients lying around, a strata is a glorious combination of toasted bread and eggy custard, studded with your favorite toppings. Bacon, mushrooms, spinach, chard, cheese, tomatoes, peppers, you name it – if you can put it in an omlette, you can most likely include it in a strada. I love this recipe for brunch guests for a couple of reasons. It’s a great make ahead recipe that requires little to no babysitting. Assemble leisurely and pop into the oven an hour before you want to eat. Drink mimosas until it’s time. Another thing I love is that this recipe rarely involves a trip to the grocery store – if you save your old bread when it gets too hard to eat, and just pluck some choice toppings from the fridge, you are in business. Worst case scenario, you have to go to the store for eggs and cream. Lastly, and most importantly, when this comes out of the oven, it looks incredibly impressive for being absolutely no work. The best kind of recipe there is. Preheat oven to 350°. Grease a medium sized casserole or small ramekins with cooking spray or butter (I used some el cheapo parchement rounds from Sur La Table for the version in the photo above). Sprinkle 1/2 c. of the cheese on the bottom of the ramekins or casserole. Place on a cookie sheet and set aside. 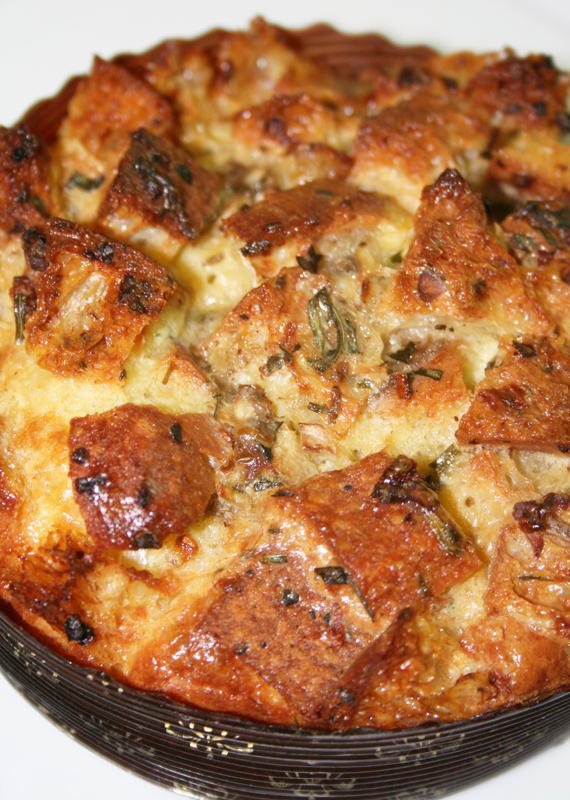 In a large bowl, toss the bread cubes with the one cup of your choice of meat and veggies, and 1 c. of the cheese. Dump into the casserole dish or split amongst the ramekins. Using the same bowl, beat the eggs, cream, nutmeg, salt, black pepper and white pepper. Pour the custard over the bread, pushing down on the cubes to make sure that they are all saturated with the liquid. Let sit for about 5 minutes and then gently push the cubes down a second time. Top with the remaining 1/2 c. of cheese and then put the pan in the oven. Bake for about 45 minutes, or until the center is no longer jiggly and the strata has puffed up like a soufflé. Serve hot, or wait a bit and eat at room temperature.